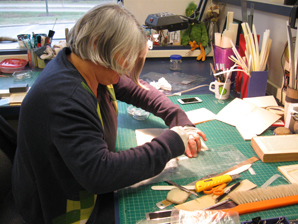 Based in Bloomington, Indiana, Lara is a bookbinder, a teacher of book arts, and a book repair specialist. She has taught bookmaking workshops at Village Lights, and you will often see her “tiny book” jewelry for sale at the front counter. Lara studied book conservation in workshops taught by Don Etherington at the American Academy of Bookbinding and earned a BA in Linguistics from Indiana University, where she is currently employed as a Library Conservation Technician at the E. Lingle Craig Preservation Laboratory. She works in the General Collections Conservation unit, which serves nearly all of the IU Libraries circulating collections. In addition to her work in book conservation, Lara has performed with the Arizona Shakespeare Festival, is a dedicated Tolkien fanatic, and bakes cookies to relieve stress.